SA 4645 Farrier Leonard Retter and his younger brother SA 4644 Farrier Darcy Retter from Johnsonville. On arrival in South Africa the 7th New Zealand and the 6th Queensland Contingent were assigned to Colonel Garratt’s column operating in the Eastern Transvaal and north-east of the Orange Free State. During June 1901 there was constant skirmishing with the Boers with casualties inflicted on both the 6th and 7th at places like Blesboxspruit, Kaffir’s Spruit. In July 1901 they captured a Boer commando at Koppjiesfontein which resulted in 11 Boers killed or wounded, 25 captured along with 34 wagons, 31 carts and 1240 cattle. More successful captures of material and men continued in August 1901 at Bulfontein, Spannerberg. These clearing operations continued to seriously weaken the Boers. The final major contact was on 23rd February 1902 where the British forces attempted the capture of the key Boer leader De Wet. In one of these sweeps the 7th Contingent captured four Boers. One of the prisoners captured was wearing a British issued khaki uniform. As this was against the rules of war and he was court marshalled and sentenced to death. 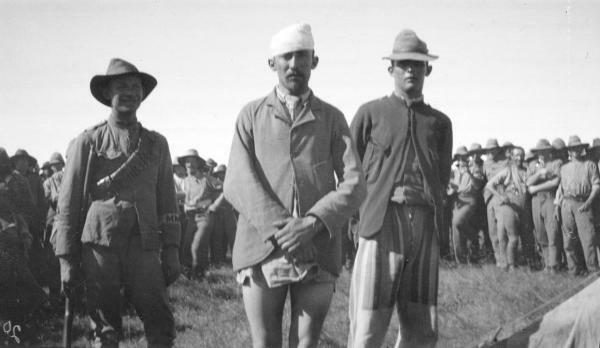 The photo below shows the man paraded before the 7th Contingent before facing a firing squad. This battle at Langverwacht is also known as the Bloody Battle of Bothasbergat. [iii] It was in this battle that 23 men of the 7th Contingent were killed including SA4645 Farrier Len Retter. After a year of operations, the 7th Contingent, in late March, started their journey to Durban and the return to New Zealand. In Newcastle the 7th Contingent was addressed by the New Zealand Premier Mr Richard Seddon. The 7th Contingent sailed from Durban, South Africa on the 22nd May 1902. Following a medical inspection in July 1902, Lance Corporal Brown was granted two months sick leave and he was provided treatment for a ‘slight cold’ at Wellington Hospital before he was discharged from the army. The 13th September 1902 discharge papers noted that his intended residence was Porirua, although subsequent correspondence to Joe was sent to him at Tawa Flat. See the stories of other local men for more details on the actions of the 7th Contingent NZMR in South Africa. Private and Trooper are both used in military papers and newspaper items, Trooper has been used for consistancy in Porirua District stories.